For those customers that use the Stores inventory module of MEX, we have introduced a new supplier invoice module. This allows a user to more easily validate the supplier’s invoice against the items that you have actually received from the Supplier. On top of the streamlined and improved interface, in order for a supplier invoice to be processed into invoice matches it must be approved. Let’s head to the Stores Control Files, in order to use the Supplier Invoices module, both the Is Invoice Match Possible and Use Supplier Invoices checkboxes must be checked. Once both these checkboxes have been checked, if you have the Approvals checkbox ticked, the two new text boxes Variance Value and Variance Percentage will come into use. These values are used to ensure the cost variance from the original purchase order and the supplier invoice is within the Variance Value or the Variance Percentage. If one of these values is zero, then it will not be used. If a Supplier Invoice is outside either variance, it will need to be approved using the approval chain of the original purchase order. Let’s jump in and create a new supplier invoice. 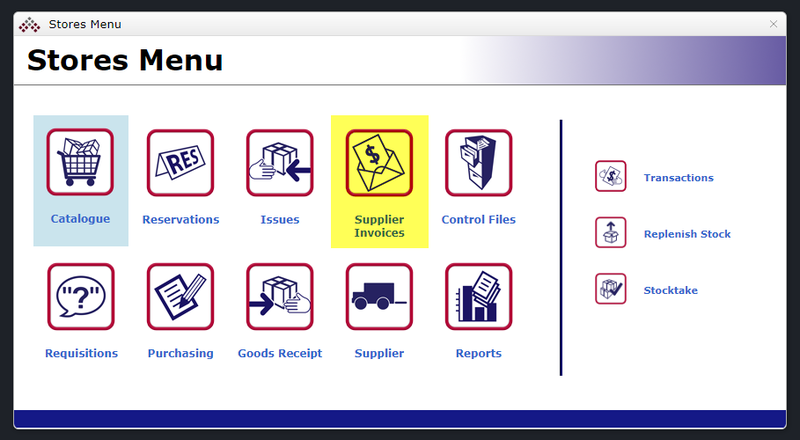 First, ensure the Use Supplier Invoices is checked and head to the Stores Main Menu. You will see a new Supplier Invoices button where the Maintenance button use to be. Head in there and click New. You will see a Details Tab familiar to the Purchase Orders Details tab. 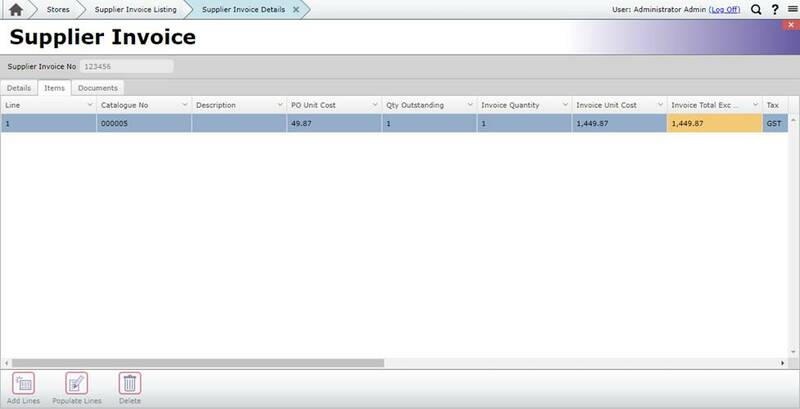 Let’s fill in the Supplier Invoice Number and then click the Purchase Order Ellipses to pick a PO to invoice match. Only Purchase Orders with receipts that haven’t been invoice matched will appear in this listing. Once you have selected a PO, head to the Items tab. Simply click the Add Lines button. All the lines which have been receipted but not invoice matched will appear in this listing. Select the lines you wish to invoice match and click Add to Invoice. Now close the window and you will see these lines have been added to the Items tab. For this example, we will highlight the lines in the Items tab and click Populate Lines. If we decided to change the Invoice Unit Cost so it is outside the variance settings we mentioned earlier, you will notice the Invoice Total Excluding Tax cell has become an orange colour. This indicates the line is outside the variance and the Supplier Invoice will need to be approved. Once we are done, head back to the Details tab and click Approve. Approving a Supplier Invoice will process the invoice matches in your Items tab. As I mentioned before, if the variance is greater than either the Variance Value or Variance Percentage, it may need to go through the original purchase order’s approval chain before processing.